This weekend, I think I finally recovered from the holiday fog I had been in. I was feeling back to my old self and ready to get in the kitchen. 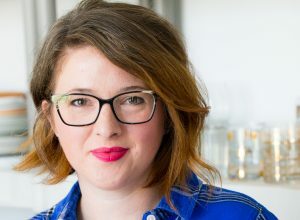 I also thought a lot about my goals for this year and began planning meals and menus that would help me along with those goals – and more specifically, not sabotage the heck out of them. Here’s the thing about me: I love salads. Seriously love them. But in the winter time – when I’m all chilly and bundled in about 3 sweaters, my sweater boots and huddled around my cup of coffee to keep warm – I’m not so much interested in salads. I will still eat them because I wouldn’t even try to deny their deliciousness as well as their healthfulness; but it’s not what I crave. What I crave are the heavy roasted, braised, stewed and baked comfort foods of the season. And being married to a half-Italian guy, these comfort foods often involve rich tomato-y goodness. Luckily, there are ways to eat ‘light’ without eating salads for every meal for the next two months. 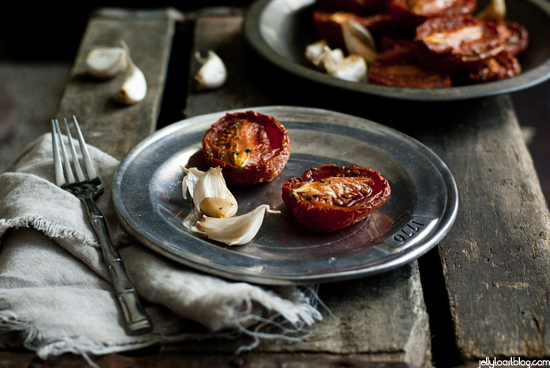 Which brings me to this awesome recipe starter: little slow roasted winter tomatoes. Yes, tomatoes in the winter are not the most flavorful little buggers in the produce section. They can be quite beautiful on the outside, but pretty flavorless on the inside – as in no flavor. 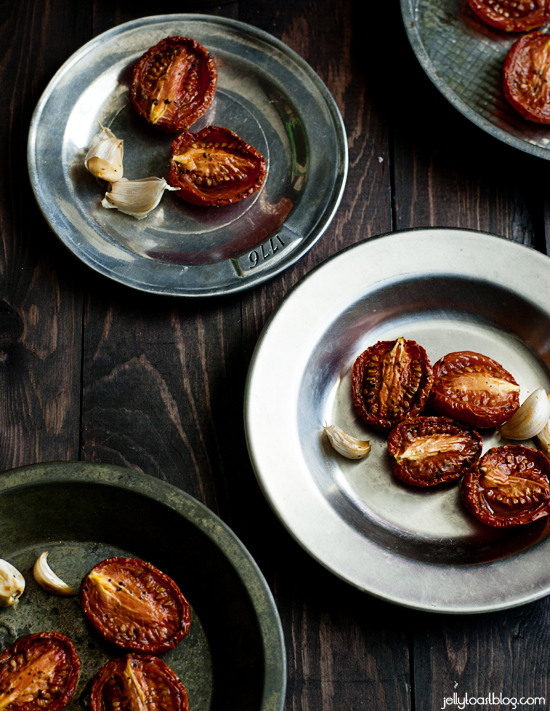 By roasting these otherwise boring little tomatoes in a low oven for a while (quite a while) you will end up with some incredibly delicious and sweet tomatoes. 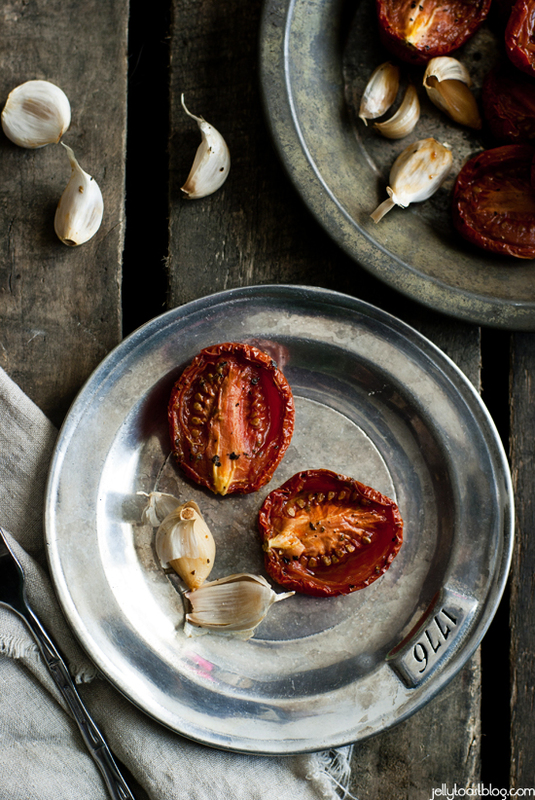 These sweet, aromatic slow roasted winter tomatoes are addictive on their own or on top of sandwiches, pizza or pasta. But be sure to make a batch to use for marinara sauce, homemade tomato soup or even bread (recipes all coming soon). Taking a note from Deb at Smitten Kitchen I roasted some garlic along with the tomatoes. Because let’s be honest, in our house wherever you find tomatoes, you find a good amount of garlic as well. Preheat oven to 225 degrees. In a large bowl whisk together oil, sugar, oregano, basil, salt and pepper. Add tomatoes and toss gently. Make sure all the tomatoes are coated with the oil and herb mixture. Spread tomatoes out onto a rimmed baking sheet, cut side up. Arrange garlic cloves around and in between tomatoes. Roast in the oven for about 5 1/2 hours or until tomatoes are dried on the outside but still a bit juicy on the inside. 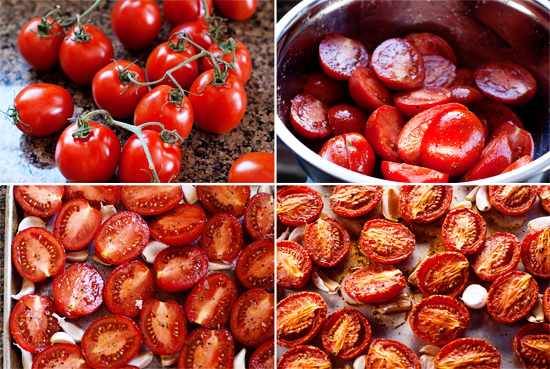 Tomatoes can be eaten as is, or you can remove the skins if using in a recipe (ex: sauce or soup). Peel the garlic cloves before eating. You can enjoy these immediately or allow them to cool and store in an airtight container in the fridge for up to 4 days. Enjoy!! I seriously love roasted anything! Plus, any technique that can improve the taste of off-season produce is a win for me! I totally agree, Loretta! I want to try this with everything, now! Is there another winter item that you would recommend roasting? These are so rustic and beautiful! Roasted is the way to go! These look gorgeous! I love roasting tomatoes in the winter! It’s the perfect taste, texture, and temperature! In the warmer months I like to roast them and add them to cold pasta salads or bean salads. I love the pasta salad idea! Every time I get together with my mother-in-law we always make some kind of pasta or bean salad. I will have to add these next time. Thanks so much for the tip! I roast all my summer garden tomatoes and make sauce every year. You can also freeze the tomatoes roasted if you want to use them to make sauce or just top pizza with ‘sundried’ tomatoes in the winter. Can you freeze these? Will they keep that awesome roasted flavor?